John Windsor-Cunningham and Rachel Pickup in The Home Place. Master desires the maid, who rejects her meal ticket. A landlord pushes back at an armed intruder, ominously portrayed by Johnny McLoone. The Last Rose of Summer and Minstrel Boy were written by Irish poet and lyricist Thomas Moore and are at the heart of the Irish soul. Satisfying direction by Charlotte Moore, undoubtedly a descendant, brings the poetry and music home in Brian Friel's The Home Place. The measure of a man, taken in detail in The Home Place, is not the circumference of his brow or the length of his arm span. Rather, it is music. We hear at first a distance chorus conducted by Clem O'Donnell, which moves ever closer as the play progresses and then recedes to fill the entire countryside. Placed in Ireland of 1878, this play feels like an Irish Cherry Orchard, set a few years later in Russia. Landowners are challenged by insurgent lower classes. The world is changing. They don't know how to react, except, in Cherry Orchard, to yearn for Moscow. In The Home Place, they plan for relocation in Glascow and Nairobi, Kenya. The trees on an Irish farm must be cut back, not for the same reasons as the cherry orchard. Yet their 'whitewashing' for execution begins the play and ends it. The most surprising U-turn in the play is Christopher Gore's. Played brilliantly by John-Windsor Cunningham, we first find his character in wilt, returning from the funeral of another landlord who has been clobbered to death in his carriage. The peasants can no longer be kept down on the farm. Gore's own property is challenged. When two rebels enter the house, one brandishing a long knife, Gore suddenly realizes what is at stake. He fills his voice and posture with a full authority that saves everyone present in the garden from probable death, by slashing this time. Later he will call himself a coward for giving in to the potential assailants, but he does not seem cowardly in the moment. In fact, one of the phrases he brandishes from time to time is "Rise Above." In this case, he rises to the level of the threat and for a moment seems an entirely different person. "Marrying out," is another big theme. A class-bound pater familias used to say, "We need new blood." In this play, it is the loveliness and kindness of the maid, who Gore calls his chatelain, which pulls both father and son out of their class strictures. Rachel Pickup in this role is warm and charming and also solid. Robert Langdon Lloyd as her father is more than salt of the earth. He leads a choir of youngsters, sung here by children from the Metropolitan Opera's Children's Chorus. He is full of life and vitality and bodes well for the future, even if he is scruffy and messy. His broad smiles, and eagerness to engage the world make for welcome relief from class binds and murderous rebels. Gore's brother is an anthropologist whose specialty is craniotomy. He clearly expects the outcome of his measurements of the lower class to show that they are deficient. His scientific explorations are aborted when a knife is waved. Christopher Randolph is perfect as a researcher who has very little grip on real people in real situations which a measuring stick can not decode. Logan Riley Bruner is a wonderful human specimen, slinking, slithering and dancing around the stage. 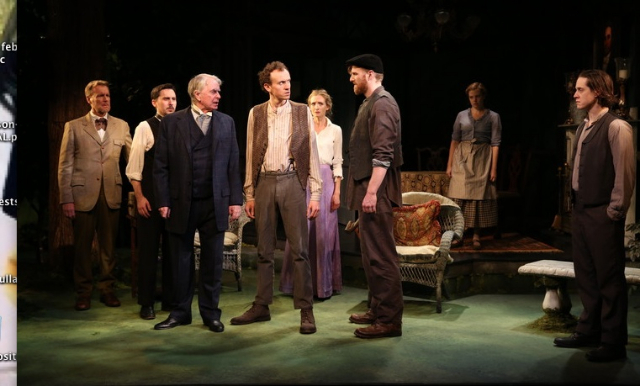 Playwright Friel is able to suggest how and why the world of the lower classes strong and vibrant. He does not preach. Rather he uses his good fortune to find music as the symbol of peasant vitality. The set by James Noone provides not only an orderly country home and garden, but a lush overhang of trees and birds singing. This image blends more with the music. Can it be that the landlords do not appreciate the beauties of their world and the tenants do? 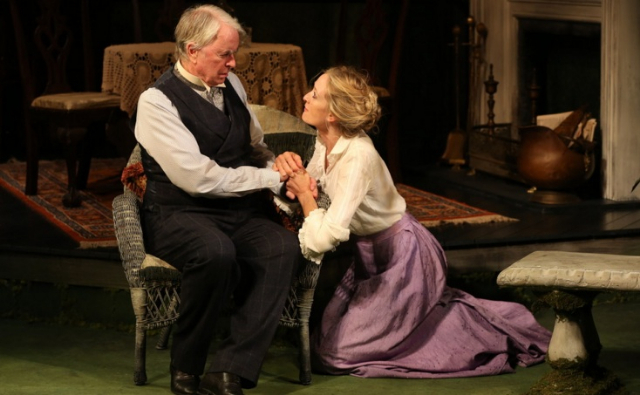 This rich and provocative production is mounted by the Irish Repertory Theatre.